What to Do About Football Concussions? On Friday, October 5, 2018, the Houston Chronicle ran a frontpage story about a Santa Fe, Texas husband and wife who have sued the school district, coaches and others in federal court for a severe closed head injury sustained by their son while playing football. The most unusual thing about this case is that it alleges the child’s civil rights were violated by not protecting him from head injury and brain damage. The basic facts of the case are that the young man was playing junior varsity football as a sophomore in 2016. A coach decided to scrimmage the junior varsity against the varsity. After the practice, the young man reported dizziness, vomiting and drastic mood swings. Tests revealed a severe concussion and that he had sustained at least 1 prior concussion. The child has never fully recovered. To make matters even worse, the child was shot during the massacre at Santa Fe High School in May, 2018. Why, you may ask, are the parents alleging a violation of their child’s civil rights? The answer is what is known as the legal defense of “governmental immunity”. The defense of governmental immunity prohibits lawsuits against governmental entities unless the State has waived the immunity in what is known as the Texas Tort Claims Act. The exceptions to governmental immunity in Texas are very few, narrowly drawn and strictly enforced. School districts, universities, colleges and junior colleges have even broader protection (immunity) than other governmental entities. In other words, the parents would have no chance of winning the case if they filed suit in a state court and alleged negligence. In fact, if that sort of case was filed, a judge would dismiss it without a trail. 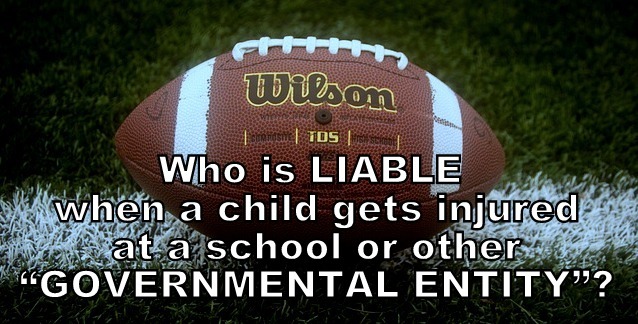 Can the parents win the case they have filed in federal court? It is an inventive and novel approach to attempt to get around the sovereign immunity defense, but I think it will ultimately fail. Setting aside the legal issues for a moment, the question of what can be done to protect players from closed head injuries is staring us right in the face. Some improvement has been made. Almost everything I was taught about tackling and hitting is now against the rules. That’s a good start, but it is probably not enough. Unless the rules are changed drastically and/ or unless there is some unforeseen helmet technology breakthrough, head injuries will still occur. With all of the football palaces we have built across the country, it seems highly unlikely that high school and college football will cease to be played. However, more and more parents are starting to say “no” to football. Will this eventually change the game to the point that only the very best, most talented and most needy play? Your guess is as good as mine.